It’s official. Total War: Warhammer II’s next campaign pack will be Curse of the Vampire Coast, and it’s due for release on November 8. The Vampire Coast are a faction in the Vortex and Mortal Empires campaigns right now, so expect to see them fleshed out. A more interesting question is what will happen with Sartosa, the pirate capital of the Warhammer world, which was deliberately added to the Mortal Empires campaign a few months ago. The Rusting Harbour – a Sartosan port – was also mentioned in yesterday’s tease as a base from which “a dealer of antiquities” plies his trade. That fits neatly with the implication in the trailer that we’ll be doing some treasure hunting as part of the new DLC, since the four pirate lords aren’t interested in the Great Vortex at all. They’re interested in what the Great Vortex has awakened: a vast and ancient Merwyrm called Amanar, which is probably the thing you can see at the end of the trailer. Amanar will be terrorising the Vampire Coast, attacking ports and summoning colossal sea storms. The pirate lords’ objective is to find and empower the Star-Metal Harpoon, which is capable of controlling Amanar and thereby dominating the high seas. It’s not totally clear how we’ll do that, but the vampire pirate starring in the trailer seems preoccupied with some Lizardmen artifacts, so item-hunting seems to be on the agenda. That vampire, by the way, is Luthor Harkon, a known figure in Warhammer lore. 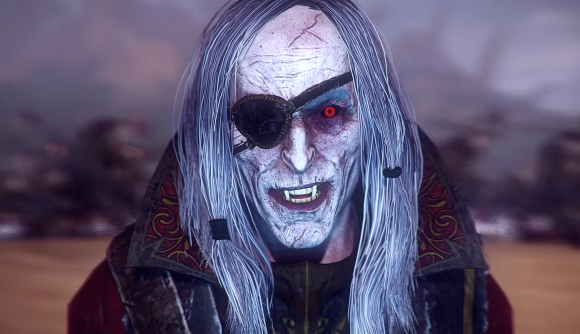 He was sired by Abhorash, one of the first and most powerful vampires ever, and established the undead enclave that became known as the Vampire Coast. While plundering Lizardmen temples his mind was addled by their protective glyphs – you can see this in the trailer – and his talk of making himself whole again might hint that he has a personal, secondary objective in the game. Regardless, you can bet that Harkon will be one of the four new Legendary Lords. As for the others, no details yet, but we’re betting some may be drawn from Dreadfleet, a specialist Warhammer tabletop game all about naval battles. The titular Dreadfleet was led by another vampire pirate named Count Noctilus, and indeed the trailer description mentions “dreadfleets”. Curse of the Vampire Coast is out on November 8 and pre-orders are live on Steam now. As is Sega’s wont, pre-ordering the game will get you a 10% discount off the usual price of £13.99 ($18.99). You’ll also find more information and screenshots at the Steam page.